onlinecasinoreward.com: Play with 150. Register, Deposit and Play at Rizk Casino. If you are already in Malaga and do not know which places to visit, all you have to do is go to any of the tourist information offices are located throughout the city. The main one is the Tourist Office and is based on the known Gardener's Cottage. Located on Avenida Cervantes, has an access area for the disabled. Another equally important office is located in the Plaza de la Marina and is open from 9 am to 7 pm There are also other tourist information points in the busiest areas of the city. Corresponding to the Alcazaba is located in Alcazabilla Street and is open Monday to Sunday. The office is on the street Cathedral Molina Lario, a few steps of Abbots Postigo. The center is located on Post Avenue in Andalusia and the hours are from 10 am to 2 pm The bus station is one of the places where you can get tourist information. It is located on the beachfront Los Tilos and only open Monday to Saturday. Similarly, Plaza de la Merced is an information and, unlike the previous option, yes Sunday is a working day. The tourist information offices also offer their service kiosks, primarily in the beach areas. Guadalmar The ride is Abel Sanchez and guides tourists between June and September. The office is located in Malagueta promenade Pablo Ruiz Picasso. To obtain such information will have a better guide to decide what to see at first glance and enjoy your vacation to the fullest. Throughout the months of Malaga offers a range of activities you can not miss. In addition, the tourism sector authorities conducted a meeting every Thursday afternoon to raise awareness of the historic and artistic attractions of the city through different routes. Beside opportunity to learn Spanish in Spain language school Picasso Picasso in coordination with the Tourist Board of Malaga schedule cultural visits for its students every week to important places of Malaga. If you want to learn more about the Muslim people, you have to choose the path of compulsory Muslim Málaga. In this tour visit the Alcazaba, an eleventh century castle full and Gibralfaro fortress dating back to the fourteenth century and is of a military nature. 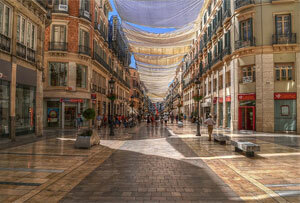 The Popular Malaga Road takes you to the most important museums of the city and the home of Picasso remarkable. For those interested in the religious aspect, the sacred Malaga Road is perfect to see the most interesting sites of this area. The tour is conducted by the city's main cathedral and the Church of the Virgin de la Victoria. Baroque interesting proposal that has in its crypt. The Green Malaga Road is ideal for lovers of wildlife. The place is transcendental Historical Botanical Garden's conception has the best Mediterranean and tropical species. Another route is the Malaga Monumental. Usually made day trips or more, and are to meet tourist cities that are very near Malaga (Cordova, Granada, Ronda and Seville), and other sites, among them Morocco, the colony of Gibraltar or the Sierra Nevada Mountains. Tourists can also be part of the tourist bus which offers two options of travel. The first is known as the green line and leads people to the bus station and the Botanical Garden. On the other hand, the red line crosses the bus station, the mall, the post office, the cathedral, the harbor, the palace Alcazaba, the Paseo del Parque, Plaza Merced (where Picasso's house), the beach Malagueta, the Santuario de la Victoria, Plaza de Toros and finally, Gibralfaro Castle. You can visit all these places through the carriage ride starting at the center of the city. It is a very attractive ride for tourists and other places that are crossed are the Paseo de Reding, Malaga Park, the promenade and the Paseo de la Farola. The walk takes about 45 minutes and the cars stop at Paseo Temboury, Molina Lario and Cervantes Avenue. You can use these stops down to take pictures or eat a snack at any of the restaurants. A conveyance that is increasingly being used by most tourists is the SmartBike. Is the use of a bicycle in a practical and sustainable, that is used for simpler route for Malaga. In that case no longer requires the presence of a guide, you can visit different places at any day and time. If then prefer a more known, it is possible to get to places far removed. The requirement is to rent a Smartbike have permission municipal authorities in transport and a debit or credit card. To access this service, you only have to go to the customer service office located in the city of Alameda Principal. If you just want to walk for an hour, the service is completely free. Two other stations in the Plaza Jesus Rico and the Plaza de la Marina. Malaga is a city characterized by welcoming people from around the world and, thanks to the mix of different cultures, the stay in this city is one of the best. Today is considered the capital of the Costa del Sol and, therefore, one of the most important tourist destinations in Spain and across Europe. One of the best places to enjoy the sun, beach and a range of leisure and entertainment options, as well has the best hotels costa del sol. If it's fun, Malaga has the opportunity to access zoos, amusement parks, botanical gardens, cruise ships, aquarium and dolphinarium. Highlight the Palace of Magic and the only park there Lobos worldwide. Some of the activities you can be part include go-kart tracks, horse shows, balloon, parachute and Racetrack. It all depends on what your preferences and time separately for fun. Malaga is also called the "City of Museums", because it has more than twenty museums throughout the country, of which fifteen are located in the central area of ​​the city. In the historic center have the opportunity to access the Holy Week Museum, Museum of Fine Arts and the Museum of Wine. It offers twenty-three museum spaces for the general public. If you want to be part of these spaces, you only have to choose a theme-or buy their tickets for the major. The truth is that the options are different, you can choose a religious museums or exhibiting contemporary art. There are also popular museums or other more sophisticated. In most of the figures highlights a global Spanish: Pablo Picasso. You can see more about him through the Picasso Museum and Birthplace Museum. Two fixed places you should visit on your trip to Malaga. The best thing is that museums are very close to each other. Therefore, you can plan to meet only one, but the closeness and interest will force you to know more. Access to most exhibition centers not complicated and are in very well marked. It is advisable to go for a walk through the streets of Malaga and take time to understand the cultural and historical beauty of this city. Some of the most prominent museums are the Museum of Citeaux, Archaeological Museum of La Alcazaba, Contemporary Art Center of Málaga (mostly known as CAC Málaga), Interpretation Centre Gibralfaro, Ecomuseo Lagar de Torrijos, Interactive Museum of Music Malaga (MIMMA) Dollhouse Museum, Cathedral Museum, Museum of Popular Arts, Museum of the Confraternity of Hope Municipal Heritage Museum (MUPAM), Museum of the Holy Sepulchre, Interactive Museum of Science and Technology Museum Loringiano, National Museum of Airports and Air Transport Museum-Aquarium Aula de Mar.